Cook the wok noodles according to the package in one maggiblokje and rinse well with cold water. 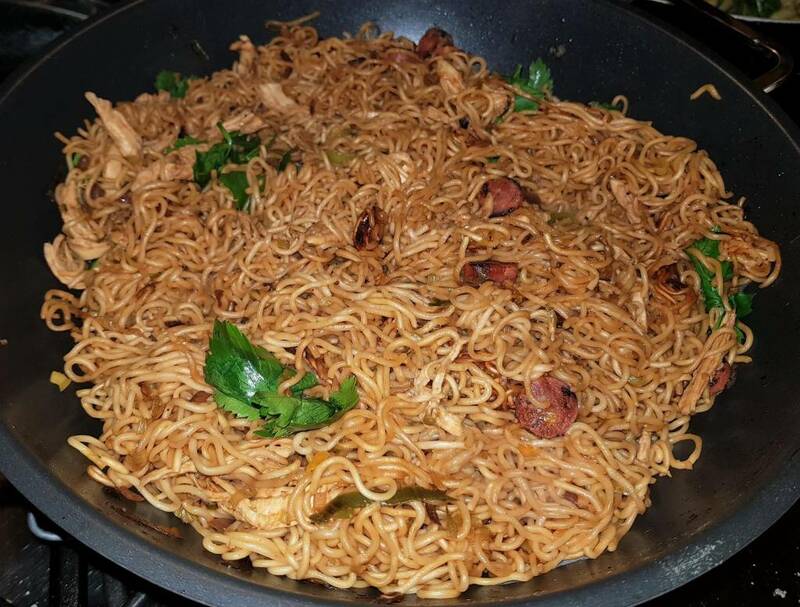 Drain and mix the noodles with half of the sweet soy sauce and half of the soy sauce and sprinkle one crumbled maggi cube and some black pepper. Mix together and put separately in a colander so that the worst of the moisture runs out .. Put water on, put in the chicken fillet with 1 maggiblokje and black fresh pepper and bring to the boil. When it boils, let the lid cook on the pan over low heat for 8 minutes. Drain and let cool and fluff the chicken apart. Set aside. Put everything washed, cut, pasted and weighed ready. Heat a pan without oil and put in the fa chong. Fry well on high heat while stirring. Add the onion, the leeks, the garlic, the adjuma, the ginger, the trassi, the erythrritol sugar, the djinten, the laos and one crumbled maggiblok and stir fry equally well. Add the tomato paste, the remaining sweet soy sauce and soy sauce and the chicken. Add the wok noodles and mix well. Turn off the heat and add the celeriac. Tasty with the Surinamese chicken fillet, the stir-fried bok choy and the sweet and sour red onion cucumber.